North Carolina teachers now rank 47th in the nation when compared for base salaries. Teachers regularly dig into their own pockets to pay for schoolroom supplies, and though there was some sympathetic clucking about that fact from some of the Republican county commissioners, when John Welch proposed adding a 1% adjustment upward on Watauga's teacher supplements, the three Republicans voted that down. 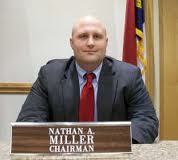 Commission Chair Nathan Miller wondered out loud why the county pays teacher supplements at all. Commissioner Miller feels the same way about appropriations for non-profits, who supply all sorts of services to the citizenry, especially the poor and at-risk. But the Western Youth Network will get zero, Hospitality House will get zero, Mountain Alliance will have its grant cut nearly in half, the Hunger Coalition will get less than half of what it got in the last budget year. Curiously, the resort towns of Blowing Rock and Beech Mountain, which are getting a new windfall from the changes in sales tax distribution, are also getting pretty much all they requested for Beech Mountain Parks & Recreation and for Blowing Rock Parks & Recreation. Meanwhile, the Valle Crucis Community Park and Green Valley Community Park were cut, the latter very substantially, from $10,000 allotted last year to $4,000 proposed in the new budget.